From the gate of the temple, you can see a big copper statue of Sakyamuni - Tian Tan Buddha (天坛大佛 tiān tán dà fó ), which is located on the top of the Muyushan Mountain. 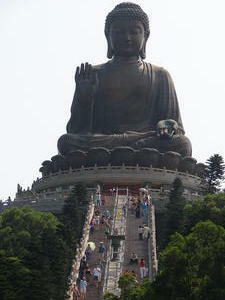 It is regarded as the largest outdoor Buddha statue in the world. Completed in 1993, the statue along with its adjoining pedestal is about 34 meters tall (111 feet), depicting a sitting Buddha in a mediating position. exhibition hall with a big bell inside. The bell is delicately engraved with Buddhist figures and Buddhist scriptures. Controlled by a computer, the bell is rung once every seven minutes, 108 times a day - in essence to 'relieve' 108 vexations. People can walk up the 268 steps to the platform where there is a tiny museum containing many elegant relics that you cannot find in the main temple. Serving as a place where the Buddhist faithful seek enlightenment through mediations, the quietness of this monastery is only broken by visitors, especially on weekends. However, Buddhist faithful and monks still manage to live in a secluded world, despite the chaos caused by the tourists. 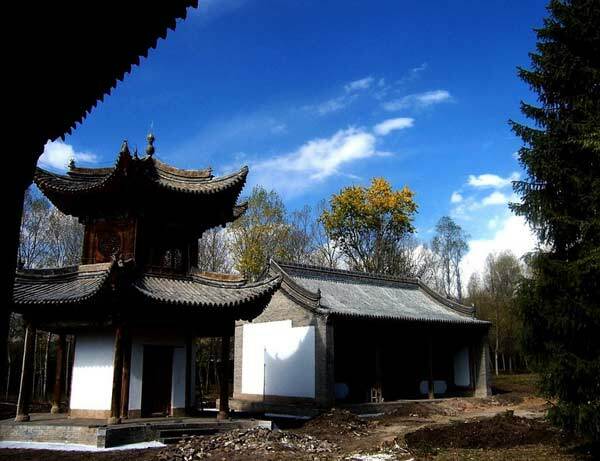 The Buddhist discipline forbids alcohol and meat in the monastery. However, if you like, you can try some of the delicious, Chinese vegetarian dishes offered at the temple.